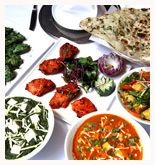 The food is fabulous - all our favorite indian flavors just blocks from our house. A great deal is the lunch buffet. dinner is more pricey. Best thing about this restaurant is that even the fried foods aren't too oily.. everything tastes fresh and flavorful. Cheesesteaks. Patricia and I got the cheesesteaks! This place does cheesesteaks. They're the kings of cheesesteaks. Anyone who would order anything else from here is nuts.